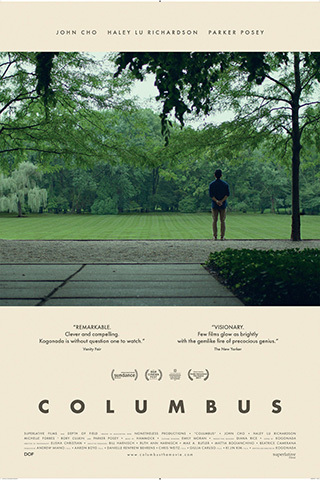 Yes, the movie Columbus does take place in Columbus, Indiana, the childhood home of current US Vice-President, Mike Pence, but there’s no politics here since first time director/writer Kogonada delves into that part of Columbus with the remarkable artistic distinction of being the hub of modern architecture in the US. Banks, post offices, churches, and homes were designed by world-famous architects such as Eero Saarinen, Kevin Roche, I.M. Pei, and others. Kogonada is a cinephile and movie reviewer who produces video essays for the Criterion Collection and Sight & Sound magazine about arthouse directors like Andrei Tarkovsky, Ingmar Bergman, Federico Fellini, Francois Truffaut, Jean-Luc Godard and his clear favorite, Yasujiro Ozu. In fact his nom-de plume comes from Ozu’s frequent screenwriter Kogo Noda. Therein lies the key to the style and pacing of this daring and accomplished new film. The story, as in Ozu’s case, is not the thing. Casey (Haley Lu Richardson, “The Edge of Seventeen”), a recent high school graduate who volunteers at the town library (an I.M. Pei building, coincidentally) sees herself as a reader and therefore a “true nerd.” She can wax ecstatic about the style, form and beauty of the architecture in town capturing listeners with her insights, clarity and enthusiasm to the point where they wonder why she’s not going off to architecture school. “And leave the beauty that’s here in Columbus?” is her evasive answer. The truth is Casey’s mother Maria (Michelle Forbes, “The Hunger Games: Mockingjay – Part 2”) is just out of a drug rehabilitation facility and still needs Casey at home; it makes Casey feel needed and she won’t leave her mother. Meanwhile a world-famous architect from Korea has come to town to give a lecture; he has a heart attack and is put in the hospital. When his son, Jin (John Cho, “Star Trek Beyond”), a translator, arrives to visit him, he hooks up with Casey, and together they tour the town, admire the buildings, talk art and architecture and how it influences their lives. It’s great dialogue as the two avoid opening up about what they feel about themselves, each other and their parents. Chin, also an informed architecture student, having learned the art form from his father, is impressed by Casey’s knowledge and he too wonders why she’s not going off to architecture school. Columbus is a slight story told without much movement or action. When the lecturer has his attack we don’t see it or see him fall, but see him later when his body is flat on the grass. When Casey and Chin first meet and talk, they walk along and share a cigarette with a fence between them during the whole conversation. In contrast, Eleanor (Parker Posey, “Irrational Man”), a doting admirer of the lecturer, meets with Jin, effusively telling him how much his father has meant to her. She is the one who got the lecturer into the hospital, and visits him, while Jin tours the buildings with Casey. Jin tells Casey that as a Korean son he’s expected to demonstrate great sadness and pain about his father’s medical condition, but he can’t do it. His father was always away and distracted with his love of architecture, neglecting his family. Casey admits that she has a similar problem with her mother being a drug addict. Kogonada’s point here is how those involved in the arts as appreciators, analysts and critics can use the art as an escape from their personal issues. Casey’s coworker (Rory Culkin, “Scream 4”) at the library says this early in the film when he debates Casey about how people who read think they are superior to video-game players when both are doing the same thing — escaping from reality with creative art. Kogonada’s camera, now becomes still as he carefully frames and composes the buildings in all their asymmetrical beauty showing how the architecture comes between Casey and Jin, actually doing the talking for them. It all comes full circle, when finally one night Jin asks Casey to stop the intellectual tour-guide patter about architecture as he already knows all this stuff, he wants to hear what she’s afraid to talk about, what the architecture really means to her, how it makes her feel. He wants from Casey what Eleanor expressed to him earlier. And with his first movie Kogonada shows respect for the intelligence of his audience, with long takes that allows them to think about what they’re seeing and what it can possibly mean. It’s a beauty.